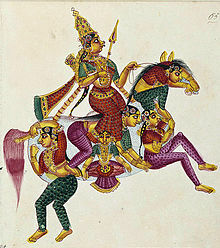 Rati (sanskrite रति, Rati) estas la Hinduisma diino de amo, karna deziro, volupto, pasio kaj seksa plezuro. Kutime priskribita kiel filino de Prajapati Dakŝa, Rati estas la partnerino, la ĉefa kunulino kaj helpanto de Kama (Kamadeva), la dio de amo. Konstanta kompano de Kama, ŝi estas ofte priskribita kun li en legendaj kaj templaj skulptaĵoj. Ŝi ankaŭ ĝuas adoradon kun Kama. Rati estas ofte asocia kun la elstariĝo kaj plezuro de seksa aktiveco, kaj multaj seksaj teknikoj kaj sintenoj derivas siajn Sanskritajn nomojn el ŝi. ↑ Swami Ram Charran (2007). The Vedic Sexual Code: Enjoy a Complete and Fulfilling Relationship With Your Lover. AuthorHouse. pp. 151, 209. ↑ Dongier, Wendy (1993). Purāṇa perennis: reciprocity and transformation in Hindu and Jaina texts. SUNY Press. pp. 52, 75. ISBN 0-7914-1382-9. ↑ PATRICIA TURNER AND ESTATE OF CHARLES RUSSELL COULTER. (2000) Dictionary of ancient deities. Oxford University Press US, p. 258, 400. ISBN 0-19-514504-6. Hopkins, Edward Washburn (1915). Epic mythology. Strassburg K.J. Trübner. ISBN 0-8426-0560-6. Benton, Catherine (2006). God of desire: tales of Kamadeva in Sanskrit story literature. State University of New York. ISBN 0-7914-6565-9. Kramrisch, Stella (1992) . The Presence of Siva. Mythos. Princeton University Press. ISBN 0-691-01930-4. Ĉi tiu paĝo estis lastafoje redaktita je 21:13, 12 sep. 2017.